The objective of this study is to acquire and/or develop commercially available equipment for conducting the Particle Additive Test (PAT) and Laboratory Stability Test (LAST). Dr. Hussain Bahia and his coworkers developed these tests under the National Cooperative Highway Research Program (NCHRP) Project 9-10 entitled “Protocols for Modified Asphalt Binders.” In the course of our study, the established protocols were evaluated and methods for improving the tests were explored. Based on the results, recommendations were presented to the Superpave® Binder Expert Task Group regarding the utility of these tests. Results from the LAST are published in FHWA-HRT 04-111 Evaluation of Laboratory Asphalt Stability Test. Jack Youtcheff and Aroon Shenoy 8. Performing Organization Report No. 9. Performing Organization Name and Address Office of Infrastructure Research and Development Federal Highway Administration 6300 Georgetown Pike McLean, VA 22101-2296 10. Work Unit No. The objective of this study is to acquire and/or develop commercially available equipment for conducting the Particulate Additive Test (PAT) and Laboratory Stability Test (LAST). Dr. Hussein Bahia and his coworkers developed these tests under the National Cooperative Highway Research Program (NCHRP) Project 9-10 entitled "Protocols for Modified Asphalt Binders." In the course of the study, the established protocols were evaluated and methods for improving the test were explored. Based on our results, recommendations were presented to the Superpave® Binder Expert Task Group regarding the utility of these tests. Additive, PAT, test method, polymer-modified asphalt binders. 18. Distribution Statement No restrictions. This document is available to the public through the National Technical Information Service, Springfield, VA 22161. The NCHRP 9-10 researchers developed a system for grading modified asphalt binders. They suggested that modified binders be classified as simple or complex; this designation initially was based on whether the binders were stable during storage or whether solid additives were present. The Laboratory Asphalt Stability Test (LAST) was developed to evaluate storage stability of modified binders. This measures the potential for phase separation and thermal degradation of asphalts. Specifically, the test aims to account for the effects of extended storage at high temperatures and of mechanical agitation, and the change in performance-related properties with time of storage. A second test, the Particulate Additive Test (PAT), which is the subject of this report, separates the additive from the asphalt binder and evaluates the volume of this particulate matter. The test is based on the concept that the particulates are not part of the binder but rather function as part of the aggregate. Where is the viscosity of the mixture, 1 is the viscosity of the suspending fluid, kE is the Einstein coefficient, and 2 is the volume fraction of filler. For such “filled” binders, their performance cannot be estimated using the Superpave binder testing protocols but rather requires mixture testing. Bahia et al. suggested that such asphalt binders be classified as complex binders. (2) The basis for the classification would be the physical characteristics of the modifier or the nature of the modifier’s effect. The PAT does not provide any insight regarding sample geometry and hence cannot be used to estimate the Einstein coefficient for the shape factor. The focus here is to determine whether or not particles have been added to an asphalt binder such that the conduct of the Superpave testing of the binder is invalidated. This project aimed to: develop a readily available or commercial version of the PAT; evaluate ways to improve the existing test; and make a recommendation to the Superpave Binder Expert Task Group (ETG) regarding the utility of this test. To this end, the protocols for the original PAT were followed. Slight modifications were made in the course of this research; these differences are largely associated with the selection of alternative filters and solvents. This modified protocol is provided in appendix A. The approach taken was to utilize off the shelf supplies and common solvents that could be used in a standardized test. Secondary considerations were cost and environmental factors. Vacuum filtration systems are available from a number of sources. Millipore is one manufacturer of a filtration system that met the requirements of the PAT and was used in this study. The equipment is shown in figure 1. The test involves adding 10 milliliters (ml) of the binder to a 125 ml Erlenmeyer flask and diluting with 100 ml of hot solvent (before taking an aliquot of the binder for testing, the binders were stirred to ensure a representative sample). The solvent temperatures 20 ºC below the boiling point were used in most cases. Experiments run using ZEP were run at 150 ºC. The solvent is added in small aliquots while swirling the flask to ensure dissolution of sample. The filtration apparatus is assembled as shown in both figure 1 and appendix A. Vacuum suction is used to speed up the filtration process. The material trapped on the filter paper is washed with small aliquots of solvent until the filtrate is colorless. The particulates collected on the filter are transferred to a centrifuge tube and solvent is added to achieve a constant volume. This is then centrifuged for 20 minutes at approximately 3000 rotations per minute (rpm). The packed volume is measured immediately to the nearest 0.01 ml, and the volume percent of particulates is determined. Figure 1. Vacuum filtration equipment. Dr. Hussain Bahia provided seven samples that were used in his NCHRP 9-10 study. These included the four simple polymer modified binders and three complex modified binders noted in table 1. Modified binders that were used in an earlier Accelerated Loading Facility (ALF) study and the NCHRP 90-07 study also were evaluated. Descriptions and properties for these binders are provided in tables 2 and 3. Table 1. NCHRP 9-10 modified binders. Table 2. ALF modified binders. Table 3. NCHRP 90-07 suite of binders. The NCHRP 90-07 modified binders include elastomers, plastomers, and a reacted crumb rubber. Two modes of modification are represented. One included simple blending for the SBS linear, EVA, and ESI. The other comprised reacted polymers, using grafting or some other form of chemically attaching the modifier to the asphalt were represented by Elvaloy, SBS linear-grafted, SBS radial-grafted, and EVA grafted. In the original work, a 200-mesh sieve (Yankee Wire) was used to trap particles larger than 75µm. Both this sieve and etched metal plates BMC SS were used to determine whether sieves of similar nominal size perform the same. The various filter types and sizes used in this investigation are listed in table 4. Table 4. Various filters and filter sizes considered. The original selection of the 75-µm sieve was somewhat arbitrary. The goal was to insure that particles if present would not affect the measurement of a sample with the dynamic shear rheometer (DSR). The assumption is that the hydrodynamic volume of the particulate does not change drastically with the given solvents. To determine whether inert additives such as lime are effectively trapped on the 200-mesh sieve, finer filters were also evaluated. These are noted in table 4. A range of sieve sizes was evaluated to determine the sensitivity of the protocol with respect to this parameter. Millipore manufactures a range of 47-mm disc nylon filters; five filters ranging from 40 to 120-µm were considered. The filters are made from Nylon PA 6, 6 (polyamide 6, 6). Their operating temperature range of –40 ºC to 115 ºC is recommended for use with linear hydrocarbons, cyclohexane, and toluene. N-octane is an expensive solvent, so researchers sought a suitable replacement. Testing included evaluating two less expensive solvents with somewhat similar solubility parameters; these included n-heptane and cyclohexane. Some chemical and physical characteristics for the various solvent systems considered are noted in table 5. These solvents have solubility parameters slightly higher and lower than that of n-octane. A second goal was to determine if toluene could be replaced with a more environmentally friendly solvent such as one of the bio-solvents. For this study, researchers selected a bio-solvent, ZEP, which is essentially α-Limonene. The ranking of the various solvents in terms of health, flammability, reactivity, and contact hazards are shown in table 6. Of these hazards, flammability is the principal concern. As noted above, the equipment needed to conduct this research is readily available. Glassware and necessary filters are readily available from a number of suppliers. Millipore glassware and filters were used in this study. Some preliminary studies were conducted using stainless steel filters. These also are readily available from a number of sources. The etched and weaved stainless steel filters gave results similar to the woven nylon 60-µm filter. When experiments were conducted with coarse metal filters (those with a Dutch weave), there was occasionally some leakage. This did not affect the results, only the cleanup. The nylon filters are disposable and the easiest to use. They did not leak during filtration and their flexibility facilitated the transfer of filtered particles to the centrifuge tubes. Shown in table 7 are the percentages of particulates determined for three NCHRP 9-10 modified binders using Boscan as the base asphalt. These include the addition of crumb rubber, gilsonite, and lime. 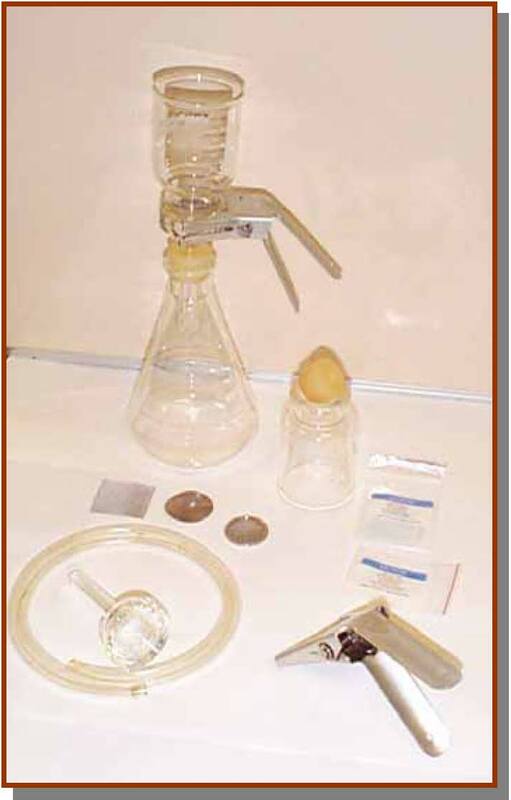 The effects of filter size and solvent selection are compared. The results using the finer filter, in most cases, did not significantly affect the amount of particulates retained; however, the filtration process took considerably longer. In all cases the amount of material collected was considerably greater than the amount of additive. The crumb rubber swells in the presence of these solvents. This was also noted by Bahia et al. (2)The volume of particulates determined for the hydrated lime sample is considerably higher than the amount added for all the solvents tested. Presumably, some of the asphaltenes flocculate with the lime. Table 7. Volume (percent) of particulate additives determined for several NCHRP 9-10 modified binders as a function of filter size and solvent. The effects of sieve size are only apparent when the least polar solvents are used as shown in tables 8, 9, and 10. Consider the results for n-heptane and n-octane using the 20-µm and 75-µm filters shown in tables 8 and 10. The results for the air blown binder using n-octane and n-heptane and the 75-µm filter are nearly the same (24.5 percent and 24 percent, respectively). With the finer, 20-µm sieve these results go up to 44.5 percent and 36.3 percent, respectively. As there are no particulates in the air blown binders, the material retained is presumably flocculated asphaltenes. The manner of their flocculation will be more sensitive to testing conditions than true particulates. Note that using the 60-µm sieve in conjunction with n-heptane yielded only 12 percent for the air blown binder. This demonstrates the sensitivity or rather the lack of sensitivity of the PAT to quantify pseudo particulates such as flocculated asphaltenes. In general, the reproducibility of the PAT is within 15 percent; higher for low volumes of particulate additives and lower for high volumes of particulate additives. Table 8. Effect of sieve size and solvent on PAT test results (volume (percent) of particulate additive retained on 20-µm Millipore filter). Table 10. Effect of sieve size and solvent on PAT test results (volume (percent) of particulate additive retained on 75-µm wire filter). The cyclohexane, a less expensive solvent, was considered as a replacement for n-octane. Cyclohexane is a slightly more polar solvate (δ cyclohexane, 8.2 versus δ n-octane, 7.6), and the filtration takes place at a lower temperature (50 °C versus 105 °C) due to its lower boiling point. However, it solubilizes more of the binder and modifier or inhibits the flocculation of particulates, such that most materials tested yielded 0 percent retention irrespective of filter size used. As shown in tables 8, 9, and 10, the overall response is quite similar to that for toluene. The less polar n-heptane was also considered. The PAT results comparing n-heptane and n-octane are shown in table 11. The n-heptane typically retains more particulates than the n-octane, but neither solvent is good for quantifying the amount of additive present. Table 11. Comparison of PAT results using n-octane and n-heptane with 20-µm filter (volume (percent) of particulate additive retained on 20-µm Millipore filter). All of the binders listed in table 11 were soluble in ZEP, toluene, and cyclohexane. One final consideration was to see if a bio-solvent such as ZEP could be used to replace toluene. Table 12 and figure 2 compare the PAT results using ZEP versus those using toluene. These results indicate that ZEP can be used to replace toluene. The technique, though not quantitative of the amount of additive, does flag those systems containing particulates that could invalidate the Superpave binder specification. Table 12. Comparison of PAT results using toluene and ZEP with 60-µm filter. Figure 2. Graphical comparison of PAT results using toluene and ZEP. The test is designed to identify the presence of solid additives. That is, materials that are added to the binder to stiffen the asphalt. Such solids would remain separable from the binder after their addition, as they do not react with the binder. These systems include crumb rubber, hydrated lime, and fibers. In conducting this research, some of the asphaltenes were trapped or precipitated with these additives and are incorporated in the additive volume that was determined, even in the presence of the more polar solvents. Although n-octane provides some insight regarding the presence of soluble (polymeric) modifiers, these results are by no means quantitative. This approach is restrictive in that the separations that transpire are based on a solubility criterion, and the solvent n-octane (or n-heptane) does not always separate the additive from the asphalt. Chemical modification or grafting will not perform as expected. Elvaloy, a reacted polymer, was compatible, meaning that it does not phase separate; however, the PAT criteria would consider this a complex material. While this approach would have worked for the previous generation of modified asphalts, new advances in chemical modification and chemical grafting of polymers will give dubious results. Many of the particles found in natural asphalts as well as lime should filter through the 75-µm filter. Their propensity to flocculate on their own or with asphaltenes affects their capture. This is a rapid, reproducible procedure for identifying the presence of particulate additives in an asphalt binder that may invalidate the conduct of the Superpave binder specification. Bio-solvents such as ZEP can be substituted for toluene, since ZEP gives comparable results to those obtained by toluene. Use of the less polar solvent, n-octane, to capture information regarding the amount of additive is of limited value. 1.1 This test method covers the separation and the determination of particulate additives in asphalt binders. The test effects the separation and capture of particles with maximum dimension equal to or greater than 75 µm following dissolution of the binder in an organic solvent. The test also allows the measurement of volume after packing using centrifugal force. 1.2 This standard may involve hazardous materials, operations, and equipment. This standard does not purport to address all of the safety problems associated with its use. It is the responsibility of the user of this procedure to establish appropriate safety and health practices and to determine the applicability of regulatory limitations before use. A representative sample of an asphalt binder is dissolved in a hot organic solvent. The solution is filtered under vacuum through a 75-µm pervious membrane filter (#200 sieve). The residue retained on the filter is then transferred to a centrifuge tube. After centrifugation, the packed volume of the particulate material at the bottom of the tube is determined. 3.1 There is a concern that particulate modifiers interfere with the testing results collected using the standard rheological methods for testing asphalt binders. There is also some concern that particulate modifiers affect the behavior of asphalt mixtures differently from non-particulate modifiers by interfering with the interlocking between aggregates. It is also observed that the use of particulate modifiers in asphalt binders will result in a complex rheological behavior. This complexity may be the result of size distribution and the volume concentration of the modifier. The existence of a high concentration of particulate additives in asphalt must be detected, because its effect on mixture properties can be very complicated and different from the effect of other asphalt additives used as modifiers. 3.2 Toluene and ZEP (Other bio-solvents may be permissible but must be verified) are solvents that have solubility parameters similar to that of conventional asphalts. When used in this test, these solvents will dissolve additives that in turn have a potential for dissolution by the base asphalt. The results of the test will, therefore, determine the volume of additives that are not likely to be soluble in asphalt. The results help indicate the nature of the additive. 4.1 PAT assembly - a container assembly designed to hold a 47-millimeter (mm) diameter nylon membrane is used to effect the filtration of diluted asphalt binder (see figure 1). 4.2 Filter reservoir - capable of holding a minimum of 250 ml of solvent. The lower part of the reservoir has a 41 mm inside diameter and is designed to secure the 47-mm diameter membrane against the filter support. 4.3 Filter support/funnel - support base of the filter has a porous center section that is 41 mm in diameter. The support base is designed to fit securely against the reservoir, holding the membrane in place over the porous section. The stem of the funnel portion should be long enough to extend down into the filter flask such that the end is below the outlet for the vacuum. 4.4 Clamp assembly - a screw type clamp is used to secure the reservoir to the membrane support. The clamp should be tight enough to prevent the solvent from leaking through at the function between the support and the membrane. 4.5 Rubber/neoprene stopper - a single hole, capable of holding the lower stem of the filter support/funnel onto the filtering flask. 4.6 Vacuum filtering flask - 1000 ml or larger. 4.7 Membrane filter - nylon filter, 47 mm in diameter with 60-µm pore size. 4.8 Centrifuge tubes - cone-shaped, 15 ml capacity with graduation of 0.1 ml from 0 to 15 ml. 4.9 Vacuum pump - capable of reducing and maintaining a pressure of 200 mm Hg during the filtration (standard house vacuum system is adequate). 4.11 Heating plate or oven—capable of maintaining the solvated system to be filtered at a temperature of 90 +5 °C (for toluene) and 150 +5 °C (for ZEP). This test should be run in duplicate to assure accuracy. 6.1 Heat the asphalt binder sample to be analyzed to 135 °C until it is fluid enough to be mixed easily and poured. 6.2 Weigh two clean dry centrifuge tubes at room temperature. Record the weight of each. 6.3 Measure a 10-ml sample of the asphalt in each of the two centrifuge tubes. Allow the sample to reach room temperature. 6.4 Weigh the tubes containing the sample and determine the average weight of 10 ml of the asphalt to be analyzed. 6.5 Using tweezers, place the filter membrane on the center of the filter support, which is mounted on the filtering flask using a rubber stopper or fitted ground glass joint. Attach the reservoir to the filter support and clamp it securely. 6.6 Pour into a 250 ml Erlenmeyer flask the same mass of fluid asphalt that is equivalent to 10 ml as determined in step 4. Add 100 ml of solvent to the flask and heat the mixture while stirring to 90 °C for toluene /150 °C for ZEP. Maintain the temperature for 10-12 minutes to ensure that the asphalt sample has thoroughly dissolved in the solvent. Occasional stirring of the sample helps dissolve the binder. 6.7 Start the vacuum pump and adjust the vacuum to 200 mm Hg. Carefully pour the diluted sample mixture into the filter reservoir. Wash the flask with more solvent and maintain the flask at 90 °C for toluene or 150 °C for ZEP, as necessary, to completely dissolve the binder and pour it out of the solution flask. Continue to pour the mixture into the filter reservoir. 6.8 Once the diluted sample has been filtered and the flask has been rinsed with solvent, wash the reservoir and filter with 100 ml of hot solvent (90 °C for toluene /150 °C for ZEP) until no thick liquid asphalt is visible on the filter membrane. With the vacuum on, leave the membrane on the apparatus for an additional 5 minutes. 6.9 Disassemble the filter apparatus by removing the reservoir. Inspect the condition of the membrane to ensure that it is free of thick binder residue. If asphalt residue is present, more washing with hot solvent is necessary. If the appearance of the filter is acceptable, carefully remove it and transfer the retained material to the centrifuge tube. 6.10 Add enough volume of solvent (at room temperature) to the centrifuge tube to complete a total volume of 15 ml and place it in the centrifuge. 6.11 Balance the centrifuge tubes by placing them in opposite sides of the centrifuge tray. Then spin them for 20 minutes at a rate sufficient to produce a relative centrifugal force (rcf) of 900 at the tip of the swirling tubes. 6.12 Immediately read the packed volume of the solid material at the bottom of the centrifuge tube, to the nearest 0.1 ml or closer if possible, and record the volume. Report the average of the two results as percentage of particulate > 75 µm present in the binder. Youtcheff, J., Wijayatilleke, N., and Shenoy A., Evaluation of the Laboratory Asphalt Stability Test, FHWA-HRT 04-111, Report for National Cooperative Highway Research Program 90-04, Transportation Research Board, National Research Council, Washington, DC, December 2004. Bahia, H.U. and Hanson, D.I., Superpave Protocols for Modified Asphalt Binders, Project HCHRP 9-10, Final Report for National Cooperative Highway Research Program, Transportation Research Board, National Research Council, Washington, DC, August 2001. Romero, P. and Mogawer, W., “Evaluation of the Superpave Shear Tester Using 19mm Mixtures from the Federal Highway Administration’s Accelerated Loading Facility,” Journal of the Association of Asphalt Paving Technologists, Vol. 67, 1998, pp. 1-41. Bahia, H.U., Hislop, W., Zhai, H., and Rangel, A., “Classification of Asphalt Binders into Simple and Complex Binders,” Journal of the Association of Asphalt Paving Technologists, Volume 67, 1998, pp. 1-41. Rangel, A., “Rheological Evaluation of Asphalt Binders Modified with Solid Additives,” doctoral dissertation, University of Wisconsin, Madison, WI, 1998.